It’s almost Valentine’s Day! Time to start baking everything pink and strawberry flavored. One of my favorite desserts is chocolate covered strawberries, so I thought I would see how a chocolate covered strawberry cake would turn out. Let me say, it turned out amazing! To make it even better you could top it with some chocolate covered strawberries! 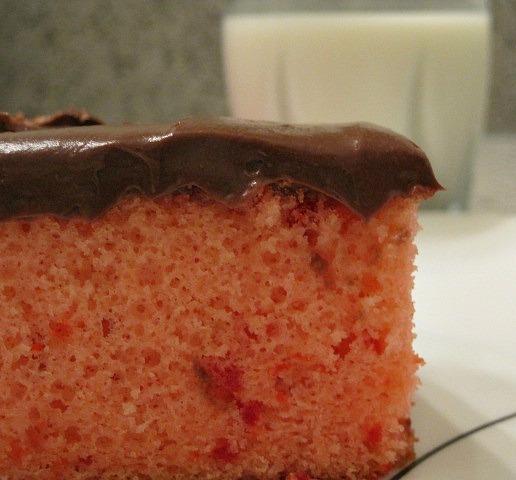 Chocolate covered strawberry cake and milk! Preheat oven to 350 degrees. Grease cake pan with a small amount of Kelapo coconut oil. Place strawberries in a small food processor; process until pureed. You should have about 1/3 cup of purée, add a few more strawberries if necessary or save any extra purée for frosting; set aside. In a medium bowl, whisk together flour, baking powder, and salt; set aside. In a small bowl, mix together milk, vanilla, and strawberry purée; set aside. Pour batter into prepared pan and bake 25 to 30 minutes or until a toothpick inserted in the cake comes out clean. Let cake cool, then frost with your favorite chocolate fudge frosting. Garnish with a few chocolate covered strawberries and serve with a glass of cold milk!